After a day climbing and walking, then that hot tub and massage, we slept dead through the night. I awoke to a humming sound. An “A” pitch. It seemed to come through the vents. Could it be the heater? A perfect “A” it seemed. 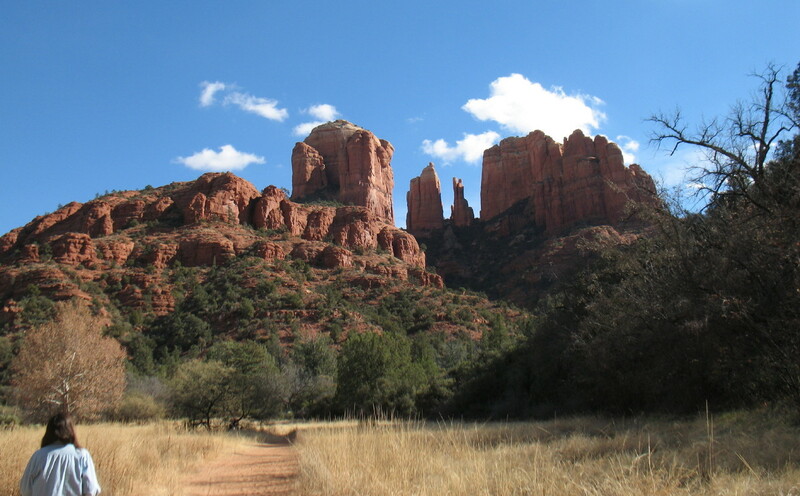 Here in Sedona, “A” is the note associated with the sixth chakra, the third eye, intuition and indigo. Could it be a conspiracy to pipe this subliminal music through the land of tourists and get them into a spiritual mood? Could it?… It was the hum of the refrigerator, through the vents connecting to the kitchen. Frigidaire was the subtle purveyor of “the force.” Hey, I’m in Sedona! Here, Woo Woo absolutely rules! Even golf is a meditation. Day #3 and time to get out there, get naked and hike! 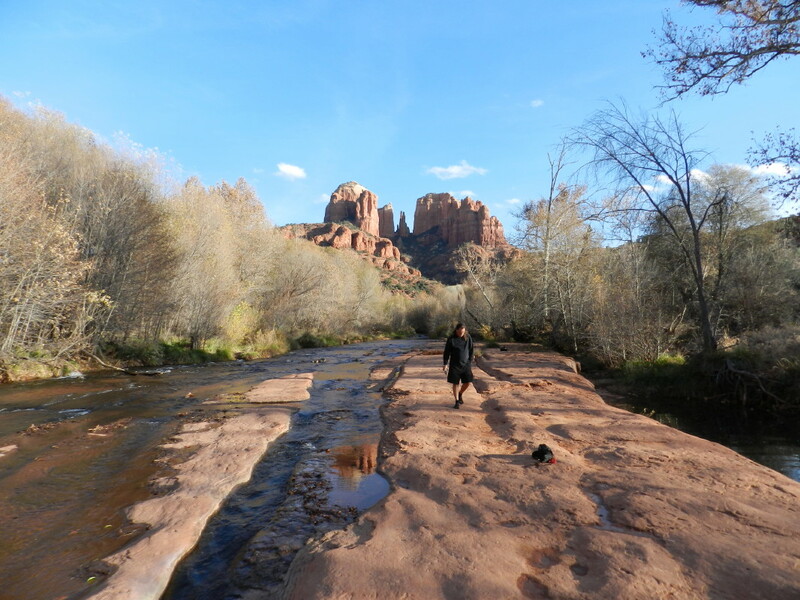 We choose the Cathedral Rock vortex, the back way, going next to the Oak Creek. The skies are turquoise, the rocks are red and we drive back through the million dollar building lots to a quiet parking lot. On the right, a cabin with stained glass, a peace sign and a pickup truck sits looking like it has been a very hip home for many peaceful years. A “lot for sale” sign labels the hill side. 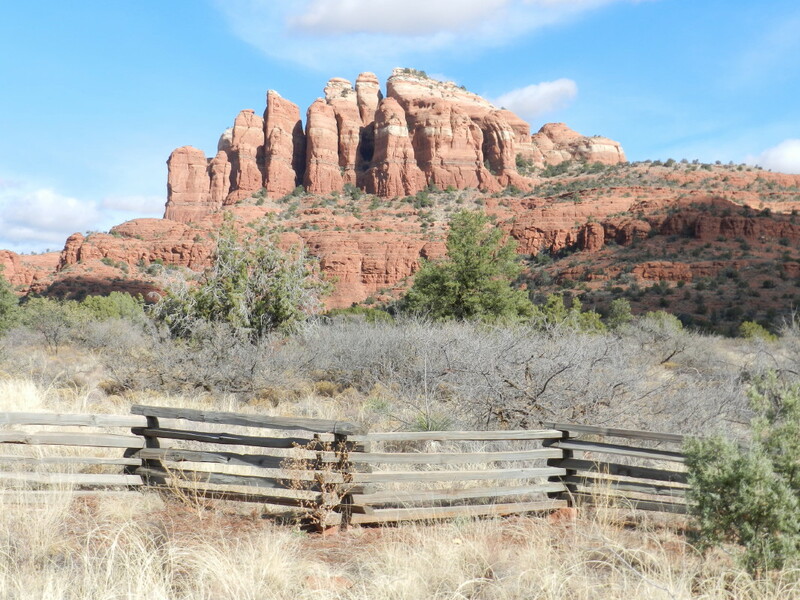 Looks like they may be selling off part of the property and retiring rich…It’s Sedona. A few steps further and we are nearly knocked over with one of those incredible Sedona views, this one looking up at Cathedral Rock. Cameras out… again…and again…and again, the cameras come out…. What a beautiful healthy delight this stroll is! 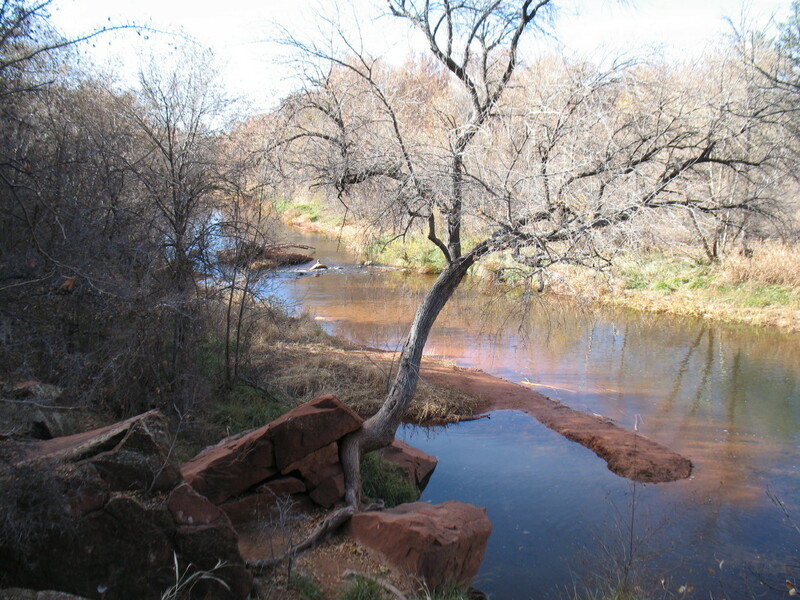 A variety of trees, a large creek falling over huge red rock slabs. The trail is like red beach sand, smooth under our fivetoe shoes. We hold hands and enjoy the smell of fresh fallen leaves, the colors of autumn and winter, on a wide path. Nothing could make this better except being naked in the sunshine. Whoosh! A mountain bike, then another. A couple with a dog. A mountain biker gets stopped cold in his tracks, suddenly stuck between a rock face and a tree by his handle bars. “A little narrow there,” I smirk. “Oh, I enjoy the challenge,” explains the biker, with machismo, as he struggles in his foolish looking pinned position. There just ain’t no getting’ naked. 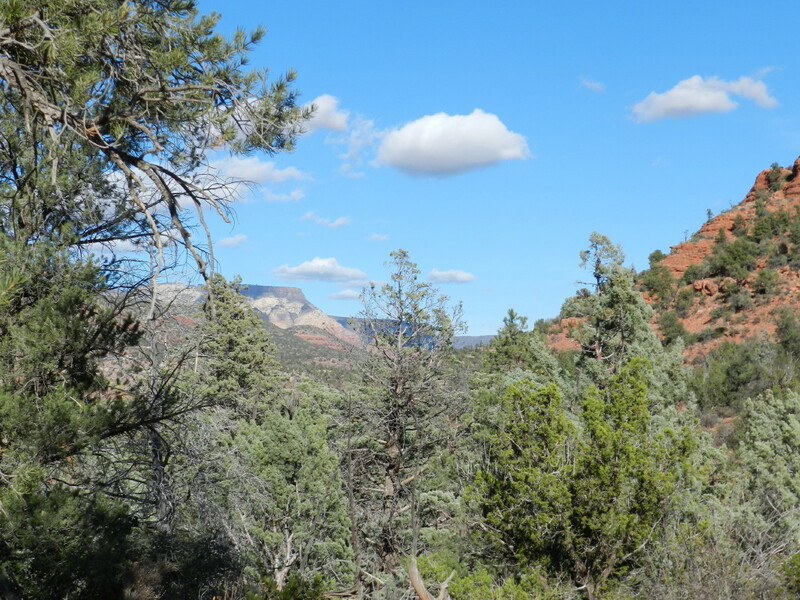 Sedona is just full of people from all over the world wandering in delight. We continue and we are having fun. 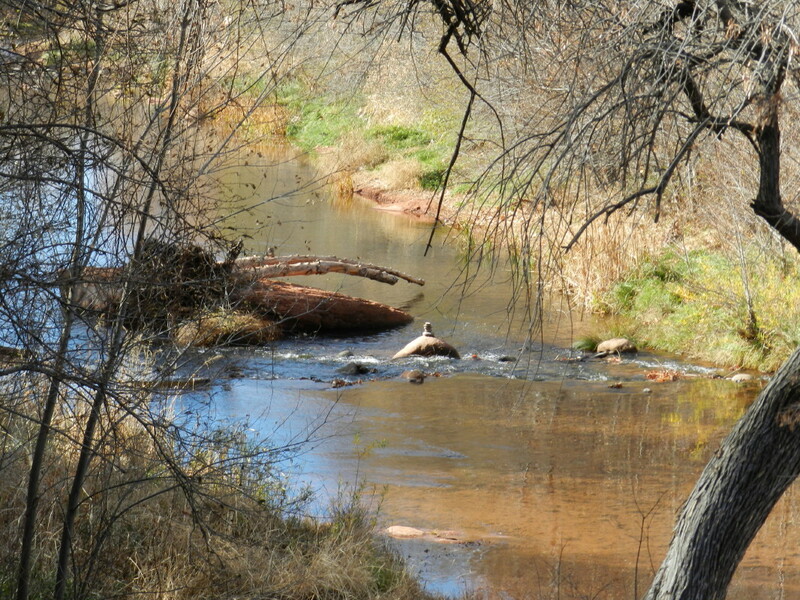 I pick up on energy and sure enough, soon the described spot comes around, seen across the cold stream. 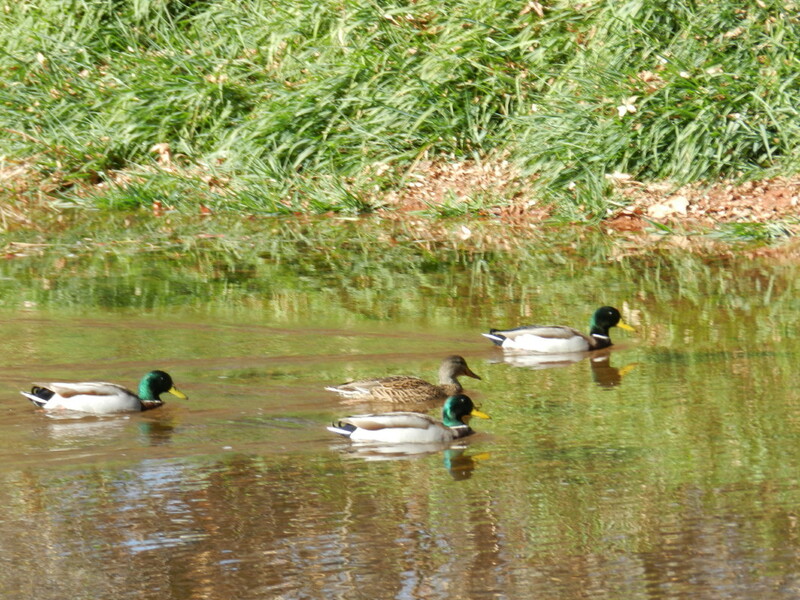 It’s cold, it’s deep or fast and I’m not into cold feet, so I get cold feet about crossing the stream. We walk back to try some other hike. Why not two? There are hikes all over this place. 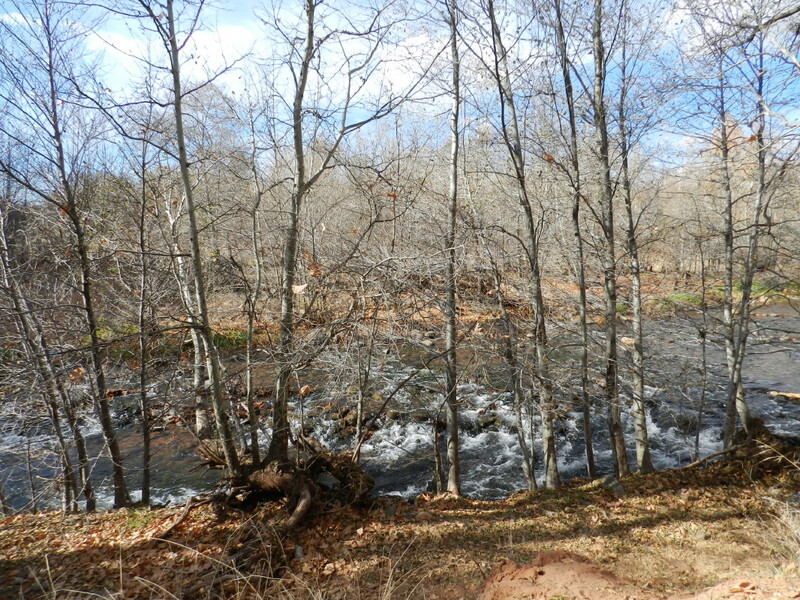 This trail runs along the south side of the creek. Brandon Trail T-bones off of this one, heading south. It takes us up a canyon at the base of the west face of Cathedral Rock. It is much quieter there, but someone can show up in a heartbeat, surprising us. We begin to look for a flat rock to picnic on. 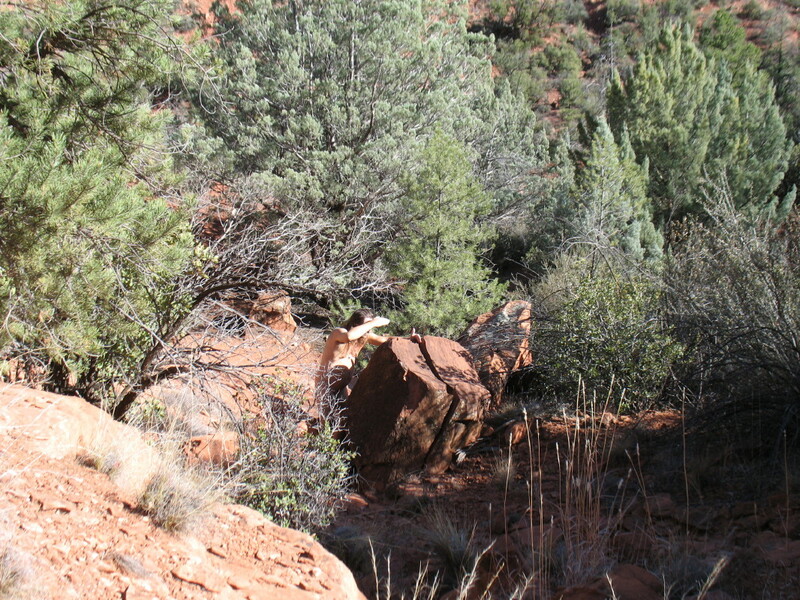 I’ve felt a little frustrated by the non-naturist aspect of this day, but I SENSE that there may be something up on this hill (It’s SEDONA ain’t it? ), …or maybe I’m just hungry and wishful. I climb up, off the trail, out of sight, to scout. I come back into DF’s view with my pants off, smiling and wave her up. She doesn’t see the rock slab that I have discovered. It’s just a couple of little rocks. This would be just okay for her. There are deer tracks everywhere, a good sign that it is safely secluded here. 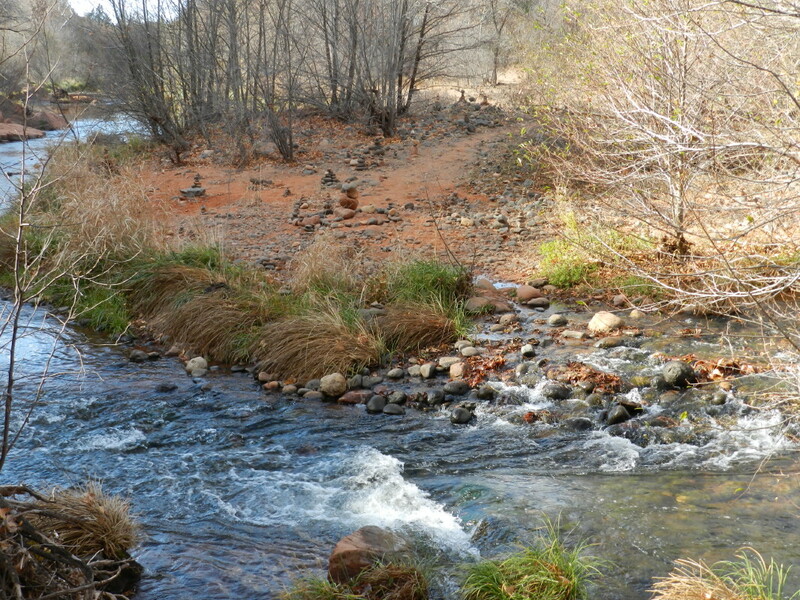 I see what could be a canyon streambed coming down the hill. 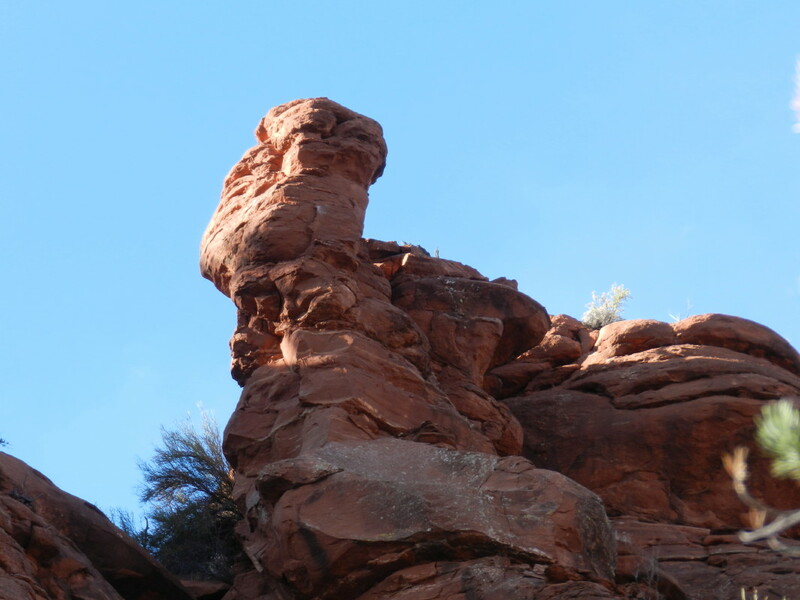 I scout it as DF waits, still gazing at Cathedral Rock above her. There up the rocky crag, is a sloping slab. I get DF; gather our stuff and we climb into this cozy spot in the sun. Maybe she is tired, but I sense more of that “just okay” in her. I tell her to turn around…BOING! A magnificent view of cathedral Rock grabs us both. We are naked, liberated, in the warm, sunshine, the rock is comfortable. We smell the pines. The light touch of ginger that she slipped into the avocado sandwiches is exquisite. It is ALL exquisite. The sun disappears around the slope and the rock gets shady. We head back, but clothing isn’t optional on the trail. Well, maybe if we were bolder. How does one know, in this international crowd, which hiker is reasonable? DF thinks that she had been near that creek trail before and that there had been a crossing, to the main vortex on the other side. I tell her that I will “humor her” and we will look for it. How bad can it be wandering around in paradise? 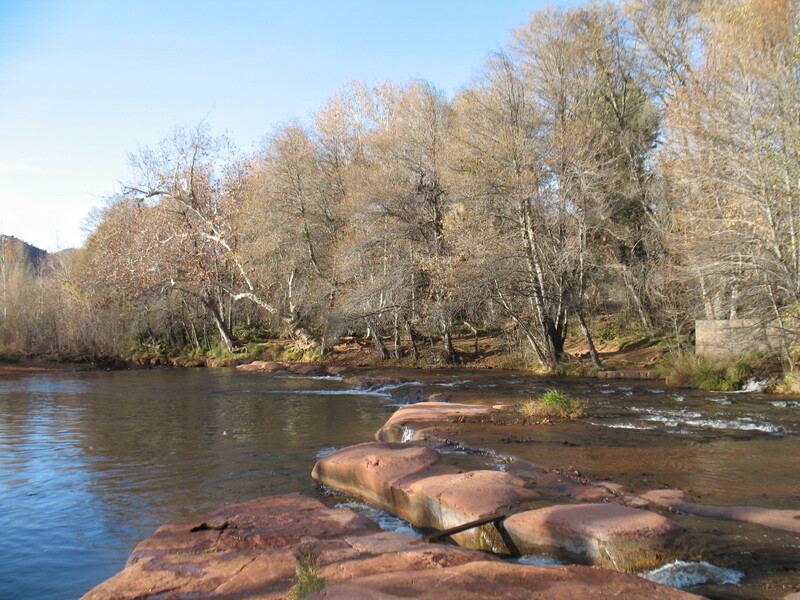 We do find a huge red rock the width of the now wide stream and it could be crossed, but with wet cold feet. The sun is getting lower and there is a chill to the air…nah, not now. Back to the crib for the evening, and the hot tub. We had been out on this “short” hike for nearly six hours, enjoying every minute of it.